Old joke, but it is very funny to watch when people hear that you are from Finland and come up with that joke like you have never heard of it before. Talking about Finland, there is a lot of misconceptions about Finnish people, our culture and habits. Yes we love sauna, salmiakki and going to the lake naked during winter, but that’s not all. There is also people who say we are not very social and we are shy. Yes, this is true to some people like in any other country in the world. But personally I think that when you get to know a Finnish person, mostly they are very kind and quite social. One of the things that make people (especially Americans) think that we are rude or don’t like to talk with strangers is that we don’t do “small talk” that much. And with foreign people, Finns usually don’t like to initiate conversation, but that doesn’t mean we are not willing to talk or to help. That’s just how we are. Summer in Finland is known to be short, dry and not too hot. Finns like to spend time by the lakes and parks during the summer, and we also have quite a few music festivals, especially rock festivals. Most Finnish people also like nature a lot. It is quite common to have a summer cabin with your family or close friends and spend time there. The cabins are usually located very close to a lake or any kind of water actually. There is of course also a sauna near by. Midsummer festival is very common time of the year to spend time on your summer cabin with your family. Spending time there especially during midsummer usually involves drinking, barbeque and sauna. We are also called the land of thousand lakes. There are about 188 000 lakes in Finland and about five million people. So about one lake for 26 people. And usually when there is a lake, there is also a forest. About two thirds of Finland’s surface area is covered in forest. Every Finnish person also has the right to walk in the woods, pick berries and swim in the lakes as long you don’t walk very close to the owners property. This is also called “everyman’s rights”. I like to think that this is one of the ways Finnish people show how they appreciate nature and equality. It’s great to be a Finn. I think Finland is a very beautiful and great country. I’m proud of my Finnishness and I like to live in Finland. We can seem quite silence and sensitive people but I think it’s only when we don’t know other people. With family and friends that’s not happening. We can have fun and enjoy of the company! The best thing of the nature of Finland is cleanness. The forests are healthy and the lakes and sea are mostly clean. That makes everything so beautiful! I love being in nature. I can just go to walk to the forest and watch and listen things around me. In Finland you can collect berries and mushrooms where ever you want and also eat those as much as you like. In Lapland the nature is quite different. There are plenty of mountains and in winter time lot of snow. That is also very beautiful sight and you can enjoy of that for example by doing downhill skiing. Finns love sauna and I do that also. We use sauna around the year. Many people have a summer cottage and there is always a sauna. So in summertime we go to the cottage and use sauna and swim in a lake or sea. That gets you a very relaxed feeling! After summer when it gets colder we use sauna at home. Many people do that on weekends on Friday or Saturday. After the working week people relax by using sauna and maybe drinking couple of beers with it. When we are talking about sauna I must mention also that in Finland it is completely normal to go to sauna with all your family and relative and many times you don’t need any swimsuit! Of course some people have ”women turn” and ”men turn” but not always at all. In Finland we have many holidays around the year but the longest and best ones are in summer and at the Christmas time. Those are the holidays when you can really forget the school and works and enjoy of the free time. The high point of the summer is Midsummer. That is a feast when most of people go to some summer cottage and have fun with relative or friends. Midsummer includes sauna and swimming, good food and drinks, bonfire and maybe Midsummer dances. Midsummer is also the time when the Sun is up longest time in the year so the night is very light. The Christmas holiday is of course because of the Christmas. That is maybe the biggest feast of the year and Finns are spending it with family and relative. At the Christmas time all stores are closed and everyone is at home. We eat lot of good food, listen to the Christmas songs, give presents and just relax. In families with little children Santa Claus comes to give the presents and that is the high point of the evening. Christmas is very peaceful and I love it! The Christmas holiday is often still going on at the time of the New Year. That is a feast when we have lot of fireworks and we are celebrating the coming year with the friends. Now that midsummer (Juhannus) is here and many of the Finns are heading to countryside to enjoy the long weekend with friends and families or to attend some festival around Finland it is quite acceptable time to think about Finnishness. Afterall midsummer is an important part of Finnishness and it is around the time when the days are the longest in here. Midsummer in Finland usually might include watching a bonfire (kokko) and eating grilled food, going to sauna and having some alcoholic beverages. And not to forget that the night barely gets dark at all which allows Finns to enjoy the long bright day before the fall comes with long dark days. Another way to spend midsummer in Finland is to attend one of the festivals around the country, especially for the younger people. Renting a cottage or staying in a tent with friends and to see live Finnish artists or bands to perform is a way to enjoy midsummer nevertheless the weather. When first thinking about the word Finnishness it brings to my mind nature, lake, sauna and good Finnish food, such as rye bread, Fazer’s chocolate, liquorice, Karelian pasty and pea soup. A bright summer nights and dark, cold, snowy winter days. These are just the first things coming to my mind, which probably are very stereotypical. 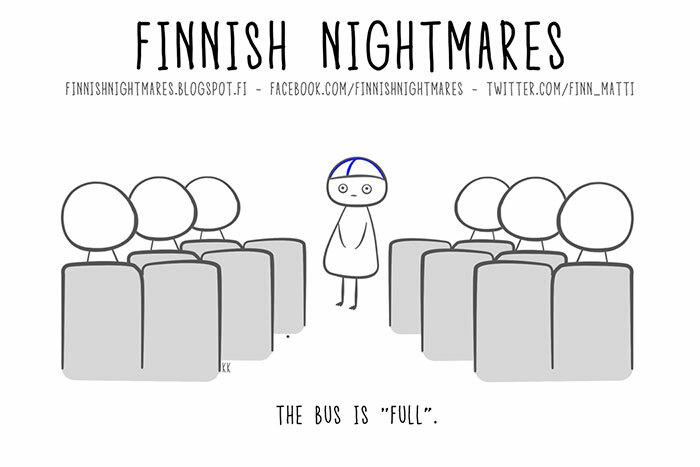 A Finnish person is also big part of Finnishness. Describing a Finn would include a quiet, calm, honest, enjoying own personal space and not caring too much about small talk. Alcohol would be part of the picture too. I personally do not completely agree with the stereotypical Finn but there are some truth to it.